UPDATE! This post was originally published on September 3rd, 2013. Right now an ancient volcano in Hawaii is causing a lot of trouble for residents. The Kilauea Volcano, located on the Big Island of Hawaii, is actually its youngest volcano, but that doesn’t mean it’s a baby by any stretch of the imagination. It is over 300,000 years old and has been constantly active since prehistoric times. It is one of the world’s most active volcanos and features prominently in many Polynesian legends, including the story of Pele, a volcanic goddess who is said to live in the Kilauea crater. There is even archaeological evidence of the eruptions that have taken place since antiquity. Footprints frozen in time leave reminders of those who have lost their lives to this powerful force of nature. The current eruption began in 1983 but has recently gotten much more violent. Kilauea’s lava is slowly spilling out over the island and invading residential areas. Even though the danger is moving slowly, the eruption is still a threat for people living near the volcano. The lava could begin spewing more quickly at any moment, which would mean a possible evacuation. This eruption seems very different from the one in Pompeii in the first century CE that was quick and took everyone by surprise. One major difference today is that we have modern equipment that can tell us what’s going on below the surface of the earth and help scientists make predictions about a volcano’s behavior. Early warnings about a volcano can lessen the destruction and even prevent loss of life. Read our post below to learn more about the volcanic eruptions in ancient Pompeii and Herculaneum, and to find out how we’ve learned from our ancient past to make a safer future. Also, check out this mind-blowing video on volcanoes from How Stuff Works. In earth’s ancient history, the most famous volcano was Mt. Vesuvius, which erupted in 79 CE and destroyed the Roman cities of Pompeii and Herculaneum. Today when people hear warnings that a nearby volcano may erupt, they immediately pack up their belongings and travel to a safer location. Why was it that the people of these two cities were taken by surprise? Today we know a great deal more about volcanoes than people of previous centuries did. Volcanoes send out many kinds of warning signals, according to “volcanologists,” or scientists who study volcanoes, and “seismologists,” the scientists who study earthquakes. Very precise and sensitive equipment has been designed to sense changes in the ground and rock formations inside and surrounding the volcano. Often, mini-earthquakes occur in the days, weeks and months prior to an actual eruption. People living in the area can feel the ground shaking for a few seconds or minutes at a time. The volcano itself actually swells in size because of the tremendous pressure caused by rising hot magma (lava or hot liquid rock) beneath and inside the volcano. This intense heat actually cracks huge rocks deep underground, triggering these earthquakes. 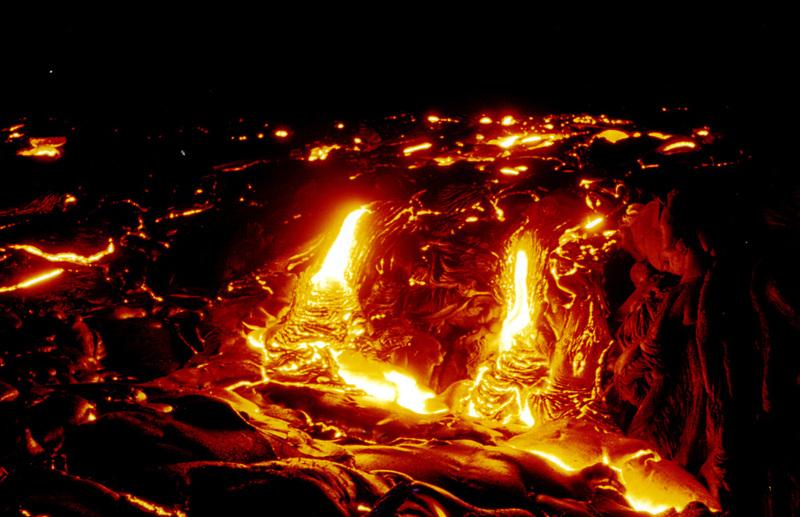 Sulfur dioxide and carbon dioxide gases travel ahead of the magma as it rises to the surface. The ground water also becomes more acidic and steam often shoots out of cracks or vents in the sides of the volcano. All these events can occur before a volcano erupts. Seismographs and GPS equipment are used by the U.S. Geological Survey (USGS) Volcano Hazards Program and other agencies around the world to measure the increased intensity and frequency of the earthquakes. The scientists also check water acidity and temperature, and identify escaping gases. This way they can warn people living nearby in time for them to escape being injured or killed when the volcano actually erupts. Back in the first century, however, none of these tools were available. The people had only their common sense, and if they saw smoke and lava spewing out of the top of a volcano, they ran for their lives. The historians of their day recorded that earthquakes would sometimes come before a volcanic eruption, so they were aware of the danger, but didn’t have the science to understand the full nature of a volcano. But why didn’t the people of Pompeii and Herculaneum evacuate the area when the earthquakes started near Mt. Vesuvius? 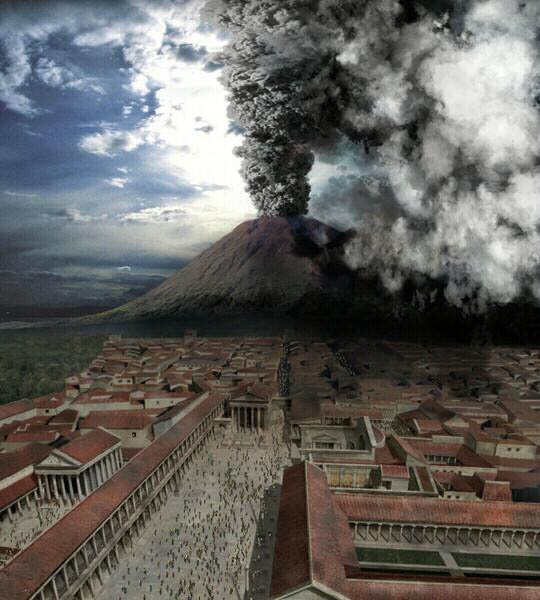 Computer generated imagery of the eruption of Mount Vesuvius as seen from Pompeii in 79 AD. Historical records tell us that in 62 CE, seventeen years before the eruption, there was a massive earthquake that destroyed much of these two cities. The people immediately got to work rebuilding their homes and shops. Life was slowly returning to normal. Pompeii and Herculaneum were resort cities for the Romans. People from all over the Empire came there to relax and be entertained, so it was important that they rebuild quickly and restore their tourism business. Unfortunately, rebuilding was slowed down by frequent mini-earthquakes that shook the ground. The people knew that often after a major earthquake, there could be several smaller earthquakes—what we call “aftershocks”—in the months that followed. As months stretched into years, though, the people became accustomed to these annoying interruptions, never realizing that they were actually a serious warning of something much worse to come. In early August, 79 CE, the shaking intensified. Assuming that this was just another aftershock, the people continued their normal daily lives. Suddenly, very quickly, everything changed. Mt. Vesuvius exploded upwards, sending a massive rush of toxic vapors, super-heated ash and chucks of rocks into the air, to a height of 20 miles. The force of that eruption was more than 100,000 times the thermal energy of the atomic bomb that devastated Hiroshima, Japan, during World War II. There was no time for the people of Pompeii and Herculaneum to escape. Heavy hot ash blocked out the sun and sky and rained down on the houses and people. Then for several hours, fiery chunks of rock fell from the sky, burning and destroying everything and everyone. The city of Herculaneum was caught in a volcanic mud slide, which totally covered the city. Pompeii was hit with volcanic ash at such great speed and force, that everything in the city—people included—were covered from top to bottom. People were turned into statues and preserved right where they stood in the streets. Archeologists estimate that 16,000 people lost their lives that day. This terrible tragedy has caused the scientists of many cultures since then to keep a wary eye on volcanoes. They carefully record every change that occurs before volcanoes erupts. 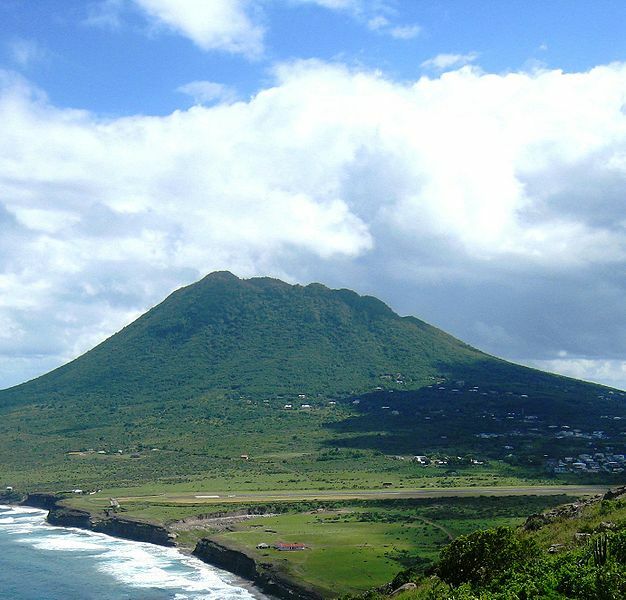 The dormant Quill Volcano in St. Eustatius. The end of the runway at F.D. Roosevelt Airport can even be seen at the base of the volcano. Even so, not all volcanoes erupt. Many have been “dormant” or asleep for thousands of years. Scientists keep recording data on them in case they start “waking up.” Other volcanoes are classified as “extinct” and people don’t have to worry about them. The Hawaiian Islands were formed millennia ago by a string of volcanoes that are considered dormant today. In Australia, Mount Napier is another dormant volcano. Australia has several volcanic plains where there are 400 dormant and extinct volcanoes close to each other. 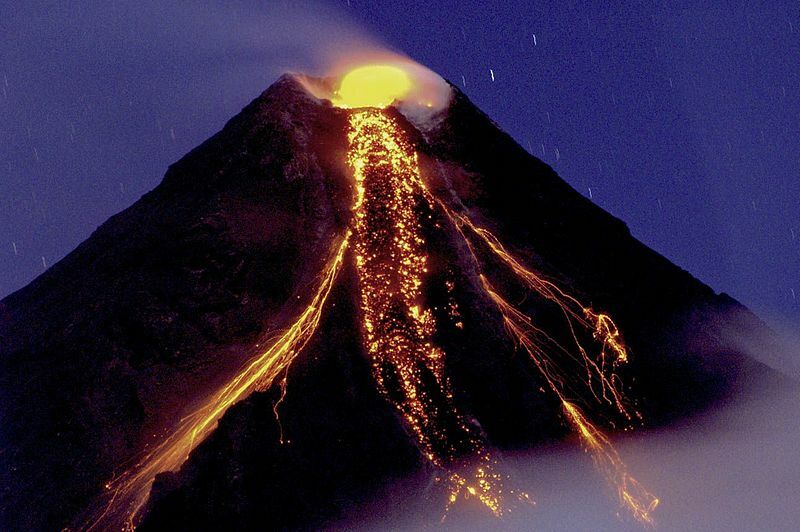 The Philippine Islands and other places scattered around the earth actually have active volcanoes. We may wonder why people continue to live on or near dormant and extinct volcanoes. It seems dangerous. There is a good reason: The soil on the slopes of volcanoes is very fertile. It makes wonderful farm land. And with today’s advanced seismographic and warning equipment, living close to volcanoes is much safer than it had been for ancient cultures. 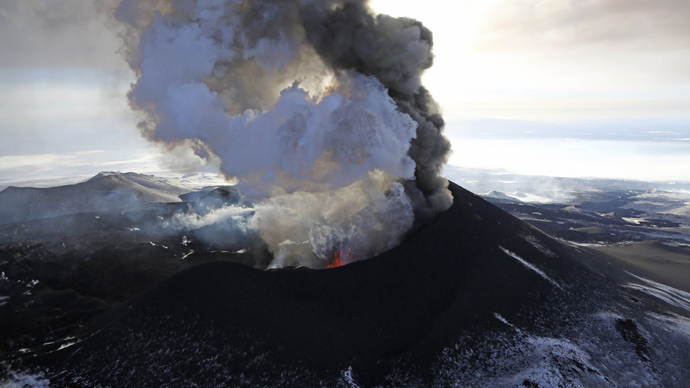 Click on the links below to see pictures and videos of volcanoes and to learn more about them. Look through the pictures on the websites above. Select a photograph of a volcano that you like. Take a sheet of paper and draw the volcano and its background. Color your picture so that it looks as close to the photograph as possible. Write a title at the top or bottom of the sheet telling where this volcano is located and whether it is active or dormant. Research active, dormant and extinct volcanoes. Find out how these three types are different and alike. Print a picture of each volcano type and on a separate piece of paper write a description, telling where the volcano is located, what type of volcano it is and the last time it erupted. Also research the people who live near each volcano that you chose. Describe how they live. Do you think that they are in any danger from a volcanic eruption? Why or why not? 1. Hawaii Story: The Legend of Pele, Fire Goddess. (n.d.). Retrieved November 4, 2014. 2. Hadar, Z. (2014, October 21). Hawaii’s Kilauea Volcano: Don’t Underestimate Its Explosive Power. Retrieved November 4, 2014. This entry was posted in Blog, Kids Blog, Kids: Meteorology, Kids: Natural Disasters, Kids: Public Life, Kids: Science and Tech, Meteorology, Natural Disasters, Public Life, Science and Technology and tagged ancient history, AntiquityNOW, Herculaneum, Mount Vesuvius, Pompeii, volcano. Bookmark the permalink.